Deciding when to plant is not always easy and subject to one’s appetite for risk. Each spring is unique, and the results vary depending on the year, but it is important to look at long-term trends when correlating yield to planting date. 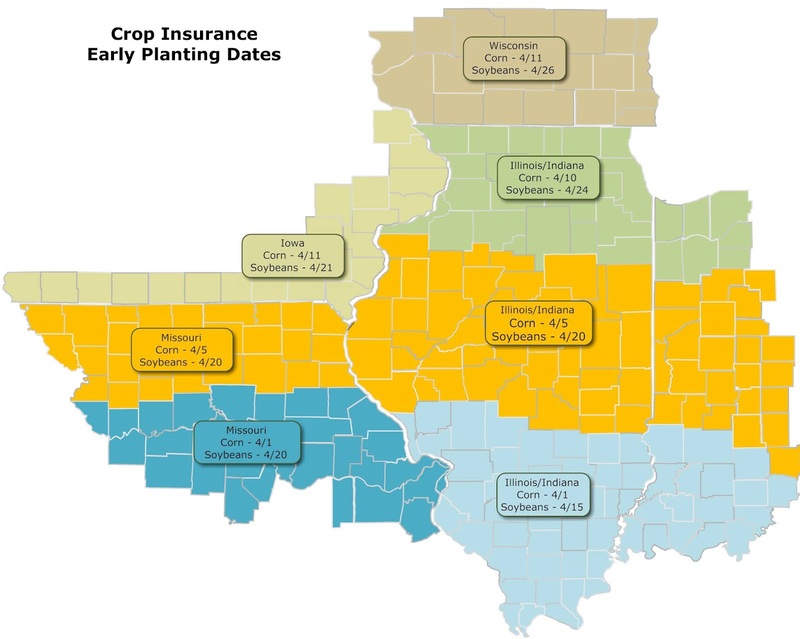 Many growers center this decision on crop insurance start dates. This date varies based on where you reside, but most who participate in the federal crop insurance program know them by heart (Figure 1). By waiting until this date, you are covered should you need to replant due to inclement weather conditions that result in a poor stand. The payout is usually enough to cover the cost of dragging your equipment over the acres again. Keep in mind you are also covered by the Burrus Seed 100% Free Replant guarantee without planting date restrictions. Offered consistently since 1935, the entire Burrus family of products qualify for free seed, free seed treatment, if available and free tech fees of equal or lesser value, if from the same technology family. Also, should it get too late in the season to replant corn, Burrus will provide a 3 to 1 replacement of soybean seed to corn. When you decide to pull the trigger on planting you can do so with confidence. Soil condition and emergence: Soil conditions are obviously important for establishment of both corn and soybeans. Conducting tillage or planting into wet soils can cause compaction issues unfavorable for root development. These conditions sometimes lead to seed placement in the furrow side wall resulting in weak and uneven stands. Wet and cold soils often lead to increased incidence of damping off from early season diseases. It takes 100-140 growing degree units (GDU’s) for the corn plant to emerge. Taking that into consideration, you should wait to plant until soil temperatures are in the 50’s and the 7 to 10-day forecast is in a warming trend. Realize a corn sprout grows twice as fast at 55° F soil temperature as it will at 50° F. Since corn’s growing point is below the soil, it can tolerate freezing temperatures well for a short period of time. At cooler air temperatures, it can take 10-15 days for the corn plant to emerge, but at warmer temperatures it may only take half that time. In comparison to corn, it takes longer for soybeans to germinate. Soybeans require 130-150 GDU’s for emergence and can tolerate cold soil temperatures if the hypocotyl remains below the soil surface. The risk for injury and stand reduction increases if freezing temperatures occur after the hypocotyl emerges. With advancements and adoption of treated soybeans, it is no longer a prerequisite that soil temperatures be 55-60° F to start soybean planting. Soil temperatures for both Illinois and Missouri are easily accessed on the Burrus Seed website. 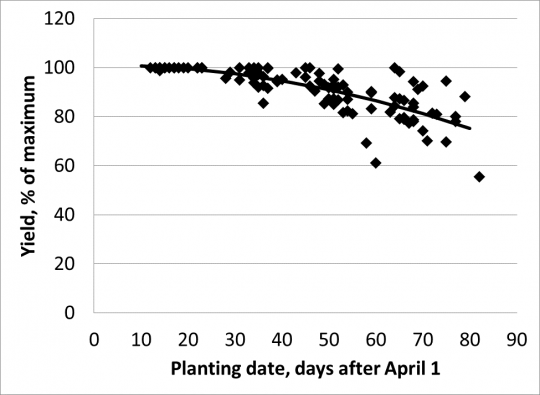 Corn yields by planting date and other implications: Through the central part of our footprint, yield reductions due to late planting are not relevant until the second week of May. Burrus research data from 2018 (Figure 2), demonstrates what can happen when planting into very cold conditions. We experienced significant stand reductions for our March and early-April plantings which led to reduced overall yield. Last year, temperatures were 5-7° F lower for the entire Midwest compared to the 30-year average for April. Given typical April weather, there is no documented yield reduction with corn planting dates in late-March and during April. Our May results lineup very closely to other documented research results examining corn planting dates. Figure 2. Influence of 2018 planting date on the percentage of maximum yield and stand averaged across 11 Burrus hybrids. It is important to remember that dry down conditions will change as harvest date becomes later with delayed planting. When average daytime temperatures are 80° F, corn will dry down roughly 1 moisture point per day; however, when average daytime temperatures are 60° F it takes twice as long for kernels to dry down. This increases the chance of frost risk and could lead to reduced yields. Late planted corn tends to become a magnet for insects and disease, and the impact on yield maybe greater since there is usually less leaf area present. Soybean yield by planting date and other implications: Earlier planted soybeans have become a trend. Many results indicate yields are significantly reduced approaching the second week of May (Figure 3). Early planted soybeans are recommended to be a slightly later maturity (0.5 MG) than what is utilized at a typical planting date to promote more vegetative growth. When soybeans reach V3, they become sensitive to photoperiod (night length) and can flower earlier. Flowering is primarily triggered by photoperiod but GDU accumulation influences flowering as a secondary factor. This means flowering can occur before the target night length is met. It is more important to include a seed treatment with earlier plantings, particularly a seed treatment with protection against sudden death syndrome (SDS). Initial SDS infections often occur early in the season under cool, wet conditions. Soybean cyst nematode (SCN) feeding is tied to these initial infections of SDS and is suspected to introduce of other early season diseases. Burrus Seed’s PowerShield® PS SDS seed treatment helps manage both SDS and SCN. If you have questions on planting season decisions, submit to our research team at burrus.seed@burrusseed.com.